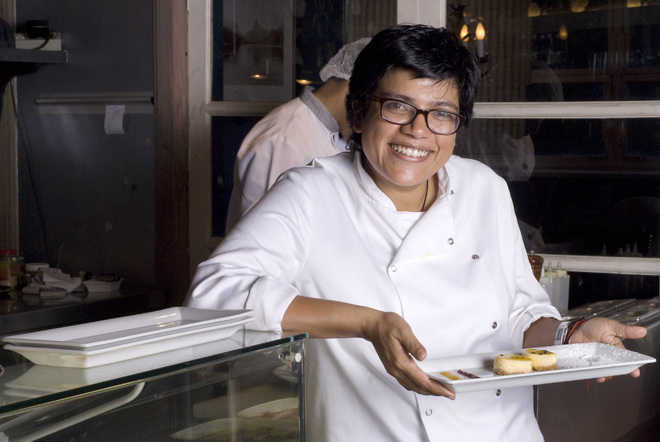 Ritu Dalmia now runs seven restaurants. Once you graduate from being a chef to a restaurateur, it gets a tad difficult to get into an apron again. But most chefs do it all the time. They run the show inside as well as outside the kitchen and only those who do it seamlessly attain the celebrity-chef status. Delhi’s One of the most celebrated chefs of Delhi, Ritu Dalmia opened another restaurant and it houses new flavours. This time, Italian spices are confidently replaced by Asian counterparts. Diva Spiced serves Asian food the way Ritu sees it — light, delicate, flavoursome. She says with a smile, “I have never done Asian food before. I wanted to see if I can do it. Doing something new keeps the brain working.”Chef’s hat is not the only one she wears and she is proud of multitasking successfully. Ritu is also an author and a TV star. “Good food,” she says, “influences the mind, body and soul. Cooking it is the most satisfying thing you can do.” Here, Ritu Dalmia talks about how she loves to cook up a storm, always!How did you become a chef?I cooked my first meal at the early age of nine. I would have ended up joining my father’s marble business if it had not been for my Marwari genes. I was determined to become a chef just to break all stereotypical barriers about women entering the profession. I started out without any formal training, relying solely on my instincts and belief that cooking is an art, guided by a natural sense of taste and talent.My first restaurant was Mezzaluna in Delhi’s Hauz Khas Village in 1993. The menu offered Mediterranean cuisine with an Italian accent. The food we served was much ahead of its time, and Delhites weren’t quite ready for it. It was the first chef-owned and chef-run restaurant in the country. It was a ‘wonderful disaster’ since I did everything, from taking customer orders to cooking, but it proved to be a great learning experience.When did you first taste success as a chef?After shutting down Mezzaluna, I headed to London and opened an Indian restaurant, Vama, with Andy Verma as business partner. That was a roaring success with the who’s who of London frequenting Vama. Celebrities like Bryan Adams, Maggie Smith and Bryan Ferry were regular diners. Vama taught me all about running a restaurant professionally, but I longed to come back to India, which I did in 2000. Along with my friend Gita Bhalla, I opened Diva, a fine-dining Italian restaurant with curated dishes and handpicked wine list. I have seven outlets now, but every evening you will find me at Diva. It a way of thanking my past, of changing the course of my life for good.What else interests you besides donning the chef’s hat?I enjoyed hosting the TV show — Italian Khana and Travelling Diva on NDTV Good Times. I have also authored three cookbooks. For entertainment, I love watching crime shows. Scandal and Quantico are favourites these days and I also love to read. Of late, I have started finding joy in doing simple things, like picking the playlist for all my restaurants. This job is reserved for me at all my places.What are your future plans?I am a very non-ambitious person. I just let things happen. I don’t really plan or have goals. I don’t have a bucket list. Also, over the years, I have learnt never to say never to anything. I believe that I have to constantly innovate to evolve, otherwise life would be so boring.What do you feel is the most important characteristic to be a good chef?Certainly, a sense of hospitality. You must want to feed people and enjoy their pleasure and happiness when they eat it. Food is all about generosity of heart. You must want to serve customers at your restaurant the way you would want to serve a guest at your house or the way your mother would cook with all her heart and soul to create something that you love. This feeling should be at the heart of cooking a great dish.Is there anyone you would like to cook a meal for?If I could have a table of my choice I would have Maggie Smith, Arundhati Roy and Sharmila Tagore, the women I admire for their talent and conviction in whatever they do.What is your comfort food?Dal chawal and aloo dahi ki sabzi, the way Marwaris make it! I think all Indians after two days of eating other cuisine want to go back to Indian food. That’s the thing about rich cultures like Indian, Italian and Chinese. These three races are least likely to adopt new tastes. We Indians will never give up our own cuisine because our own culture has such a huge and fantastic culinary repertoire.